The way in which we as individuals create masks that we use according to specific settings or contexts is something that weare all familiar with. The emergence of the selfie and the preexisting culture of self-portraiture are visual proof of the fact that our own perception of the self is not a mere internal process: it also takes a visual – and factual – form. Contrary to the most obvious reaction to the term, a mask is not necessarily an opaque wall that covers who we are. Recent trends – or a scroll around our Instagram feeds – disclose that contemporary masks are, for the lack of a better word, a filter that enhances what we think are our most covetable traits, but also hides a range of secrets rooted in our true nature. Masking is inherently strategic, and all strategy has a purpose. Erving Goffman one of the most influential sociologists in the 20th century, already claimed that the way we act in social settings mimics the way actors face an audience: our script depends on the setting we participate in and the audience who is watching. But if we stay away from theory and ignore the fact that there are those who study the existence and purpose of these masks in fields such as sociology and anthropology, if we look closely at the real world of non-academia, the masks keep existing and most of us look away without acting upon this process. Pandemonia does. This is not to say that she is not masking herself. On the contrary, she is literally a mask – which is a revolutionary plot twist in the story. As I speak to her, Pandemonia refers to thinker Roland Barthes and his quote “The birth of the reader is at the cost of the death of the author”. Pandemonia is well alive, though, and spreads glossy colour strokes wherever she goes. She’s been defined by many – consequently in many ways. Doll-like figure, pop-art embodiment, living inflable, walking Barbie, a real-life Lichtenstein paiting. No one knows this list of options better than herself. She is unlike anything or anyone and provokes the most mixed and contradictory feelings. Her presence is never unnoticed. It’s hard to know what the public really thinks about her – there are a lot of options behind a reaction of surprise. There might be a lot beyond the surface but at the same time there might be nothing more than that. Postmodern or outdated as it may sound, the surface is as true as what lies underneath. Aware of the multiplicity of readings her persona might cause, her arrogance is nowhere to be found – which doesn’t mean she hasn’t suffered from it. The story of Pandemonia is for the reader to tell. The work of Pandemonia is like any other piece of the arts and literature: it taps traces of history and creates of a brand new weave out of a preexistent reference system. This time the texture is different. References melt with each other in a liquid form that she solidifies. Pandemonia is thought provoking and yet the most common reaction to her presence is taking photographs. Your judgment says more about you than about her. Interesting enough is that she, unique and extravagant as she is, defines herself as a mirror. Everyone can choose what to see in her, but if we look carefully we might see the reflection of our own mask, the one we use to protect ourselves and face the world. Perhaps that is the reason why we are inclined to the instant gratification of photographing in her presence. Facing our own fears might be just too daunting. Rocío Garrido Rus: Pandemonia, do you remember your first appearance? Pandemonia Panacea: I had been thinking about doing Pandemonia for quite a long time. I had been thinking about what kind of art I would like to see. We get this paper in the London underground, the Metro – it features celebrities and stuff. It’s very bland. I just thought it would be really good to have a celebrity, an art form in the celebrity slot that could have some kind of comment to throw back at what’s going on in our culture. It really sort of happened when fashion week came up. I had been thinking of this for years – that it would be great to do something around fashion week as opposed to in a gallery. Fashion week was when I started doing it properly. I had been at parties and so on before but that was a completely different thing. I had never been to a fashion show before. I had this selection of images in my mind, like, getting out of a taxi, meeting the press and the public. I saw that Iris van Herpen was doing a show and I didn’t know her work at all either. I just looked up some pictures and I thought her work looked really great. And it was. So I thought that was the show I wanted to go to and I just turned up. RGR: Did you have an invitation? PP: I can’t remember. I may have asked for one but they wouldn’t have known who I was. So I just turned up, stepped out of a taxi and instantly the PR came down and put me straight through and I ended up sitting at the front row of the fashion show. I didn’t really know about this kind of hierarchy stuff before. But that’s how it started. RGR: So you got a good reception? PP: Yes, it was good. People were amazed. I could have done it in a gallery, that is a closed, safe environment. But I feel like the world has moved on. We have celebrity culture, we have social media, and I feel that’s really important. If I can somehow make an art form that can integrate with that – I thought –, if I go to a live event, people there might photograph me, and I will end up in social media and that might be more relevant. Will they think about what I am doing or about what they are doing? Will they deconstruct the story that they’re given? RGR: Do you think that this ability we all have now to build our own persona has made it easier for people to be more receptive to you and your performance? PP: I don’t know. I’ve been doing this for a while now but I’m still quite outside the box from what people are sort of used to. I find that people go to an event and there might be some drag queens there, a performance in a certain way. But I’m completely outside of all that. Particularly with me being outside the system is more important. I can move through these imaginary worlds that people have. If I was in a gallery as a performance artist I would be you know in a close circle. Sometimes they don’t know I’m coming. Or they might now I’m coming but the public doesn’t think about what I’m doing. They have to question. I’m anonymous too, that’s very important. If everyone knew who I was… You know, all these questions, they have to figure them out themselves. RGR: It would be more about you than about Pandemonia. PP: Yes, of course. You can’t go to Wikipedia and get an answer. RGR: That’s key. The question of who you are is one of the few questions without an answer in the Internet. PP: People have to think. They just go and look me up online. Which in a way is a good thing, but they’re not actually thinking. RGR: What was the reaction of the people who saw you for the first time? PP: They were shocked, amazed or silent, and they started taking photographs. It is so beyond their expectations – or it was, back then. RGR: How did you feel then? PP: It’s kind of scary, exciting as well. I feel like I’m sort of doing something, culturally changing something. My behaviour and how I present it is like I’m skipping symbols and ways in which I’m supposed to behave. In quite a radical way, but in another way I’m pretty conservative. I’m actually not doing anything, I go to the show, I talk to people… I’m just being Pandemonia. RGR: What made you decide that it was the time for you to show up? PP: I think that when social media was getting bigger and bigger I thought, we can all make our own story now – why don’t I make my story? Why don’t I make a story that talks to people or tries to talk about things happening in our world, as opposed to being passive. RGR: What is it that you want people to question and think about? PP: I think that’s something the public should be thinking about themselves. That’s not something I should necessarily say. I’m thinking of many things at the same time; my viewpoint changes. While being Pandemonia I could change as well because I see the world differently. RGR: Why did you choose to make your first appearance in the major event that is fashion week? PP: If you think about it, I created this kind of art celebrity. I’ve already established that maybe a gathering isn’t the right place to do it, because it would be kind of placing it off. So, where would a celebrity go? I’m sort of suggesting glamour and all these things, so where is the best place to go? A fashion show is a very obvious place. You just go and sit down. RGR: It’s also a place where a lot of people want to go. It’s very desirable. PP: Yes, because of all the glamour. They’re two sides of the same coin. And also, in the fashion world. I didn’t realize about this at the time, but they’re more open to technology and new media than in the art world. Everybody was doing Twitter, and commenting right away there, and filming; they’re participating in this collective discussion. That didn’t happen in the art world. The art world is not like that. In the fashion world people see you there, they look at you, they photograph you and they talk to you. The art world is different; it’s a different sort of etiquette. And I think that essentially making art is about the self, and people, and how you look or how you interact with culture. RGR: You navigated into the art world later on. Was it a good move to start off with the fashion world and then make your way towards the art scene after you had established your persona? PP: Yes. I started going to gallery openings as well. But I didn’t go to gallery openings to say hi, look at me. I went as part of the Pandemonia performance. I’m still performing Pandemonia. I’m very particular about where I go or where I show the work. RGR: How would you define yourself? PP: I’m a contemporary artist. Pandemonia is a bit like a Trojan horse. It’s shiny on the outside, but in the inside it’s something else. RGR: What is your favourite way someone has ever described you? PP: Vanity Fair once called Pandemonia “The authentic ‘it’ artificial girl”. I thought that was funny. I like it when they get into it, when they participate in the idea. You know The Mirror, this tabloid paper we have here? They did an article about how Kylie Jenner was accused of copying Pandemonia’s style, with different pictures of different outfits. Which is funny, it’s great. I like it when they get into the idea and they play around with it. I think it’s fun. RGR: Does it worry you that some press will focus only on your looks but not on you as an artist? PP: I have no control over that. I talk to the public. A lot of people won’t think about it in that sense. Some people will see it as costume, some people will see it as fun, some people will see it as art. Everyone will read it differently. RGR: To me you are a very much in-the-face critique to the unattainable beauty ideals that have led trends for decades. Still, you are very welcome in circles like fashion week, where those ideals are promoted. Why do you think that is? section of people who like it, who just like it, and think it’s good. RGR: Do you consider your look to be unattainable? PP: I don’t know – I never see myself. RGR: How would you define the fashion industry? PP: Ruthless. What is considered ‘in’ and ‘out’ is so flimsy. I think it must be really hard living and working in that world. The fashion world is like a big pyramid with lots of game keepers, very important people. There’s a sort of envy. But none of those rules apply to me, I’m sort of passing through. I’m not properly integrated into it because I’m Pandemonia. RGR: And the art world? PP: I find the art world very cliquey, extremely cliquey. In the art world they really feel like they’re the pinnacle of culture, which is very sad. And I have to say that’s wrong, be­cause there are many pinnacles of culture now. It is very ar­rogant to think that. You know, I was talking earlier about so­cial media and how the fash­ion world are really connect­ed – social media is something which is happening in society that they are aware of. In the art world it’s so slow to take in this kind of ideas. RGR: It feels like the fashion world is so aware of the ideals you criticize that when you show up everyone gets some fresh air – it’s some kind of ironic masochism. We all in the fashion world are aware of this. PP: We are all connected through this. Our lives are being commodified and we are all connected into this discourse. Something is happening. In the art world you have people who think doing art about beauty is trivial and I disagree. I think beauty is very important because, what is it? It moves people, it moves money, it’s a great persuasive, powerful tool that is being used on us. It’s something that needs to be discussed and talked about. Saying that beauty is very 19th century or something like that is really missing the point. RGR: And it’s so linked to desire, which moves even more money. PP: It’s such an ironical thing, isn’t it? Beauty is actually very dysfunctional. You assume it to be a very pure, healthy thing but it’s really inverted into something else. Pandemonia is very a dysfunctional being and it kind of works – it’s very connected into this. RGR: I think that the problem in the art world is that you have to wait for someone else to claim that a certain thing is accepted. PP: That is very true in the art world. What do they call it? There is this consensus. But in a way it’s a bit like fashion, isn’t it? What’s in, and what’s out. RGR: But as you said the art world is very trivial. Fashion in the end is more limited. PP: We’re talking about clothes and some kind of appearance. RGR: Yes, in the end it’s about the way you choose to present your body and yourself. And the art world can be about anything. PP: Yes. There is no narrative, no direction. In science there is a direction – there are many directions. There are definitely directions. But in the art world there is this, nothing. RGR: It feels like a terribly important guidance is the reputation, the fame, the name, the recognition. The fact that someone has already mentioned something makes it better than something that has never been mentioned before. That dynamic is tricky. In that sense social media is changing things. PP: I think so as well. That’s one thing I’ve said in the past. I like to go out there and show my work directly to the people, to the public. Because some people might not like it but it actually affects and moves people in all different levels. Some people might understand it, or not, but that’s ok. I would like some kind of art establishment to get behind me but if they can’t because they have their consensus thing or it’s not in this week’s agenda… I bypass that. I think an important fact is that I get a worldwide response – from Chile, China, Australia, all kinds of faraway places. RGR: Has Pandemonia helped you spread a message that you wouldn’t have been able to communicate otherwise? PP: Yes. I think so, definitely. An image is a thousand words. My image is going viral. I’ve had moments when my image has been in the mainstream press with all the other celebrities. My image is very loaded; it changes stuff around it. My image and my ideas are going straight to these people in the fashion magazines and tabloid press and they have the target of the advertising world and the fashion world, and I’m able to get my image out to them. RGR: You attend these events, you are among celebrities, you talk to them. These conversations that you have and these relationships you build with the people in these circles, are they just superficial because of your ‘character’ nature? Is that something that deliberately aligns with how superficial these events and relationships seem to be? PP: I have played around with this idea with the speech bubbles I have. Surprisingly I’m not very celebrity oriented. The more I’m Pandemonia the less I am affected by celebrities. I’m withdrawn. I don’t read these newspapers anymore. I don’t have a television anymore. I kind of see normal people and celebrities as quite similar from my standpoint, because I’m strange. RGR: This line is even more blurred now with social media – everyone can be their own celebrity. When it comes to your aesthetic, where did you take inspiration from when you created your first Pandemonia look? PP: It came from printmaking. I wanted to make a sort of über-person. I didn’t want to make a person dressed up with normal clothes. I wanted to make something psychological. I wanted to make a symbol of a person. That is why Pandemonia is very cartoon-like. I was also thinking about the logo: you can photocopy it, you can print it badly, you know what it is right away from the outline, it has simple colours so it can be reproduced easily. I was thinking a lot in these lines. That’s how the first Pandemonia incarnations came about. RGR: I’ve read a lot about your image being associated with visual work by Warhol or Lichtenstein. Are these references true? Did you get inspired by them deliberately? PP: I would say these references were kind of on purpose. Take Lichtenstein: he is referencing printing techniques. He is into pop culture. These printing tech–niques he’s referencing are comics. You know, we both have a similar source. RGR: It’s more like you both have similar references. PP: Yes. There is a similar base reference in there. But it’s not like Roy Lichtenstein is someone that I collect im­ages of and I’ll do my version. Pandemonia is not a pastiche of things; I wanted to cre­ate a new form, a new person. The clothes, the hair… It’s all quite unique. I don’t think there’s anything like it be­fore. In geometry you have the triangle, the sphere and the cube. I think it was Plato who said they were the playthings for the gods. I’m thinking, what would the modern forms be? Fractals are like a modern sort of shape, so I was trying to make my über-person out of fractal shapes, sort of. RGR: You say your character is very cartoon-like. This makes me think of your face, which is very vague. Why did you choose this facelessness? PP: The face is quite neutral, it’s not laughing or smiling. This kind of neutral expression fits better with all the things around it. Oddly, sometimes when you see photographs it looks like there’s expressions in there. It might be the light, or the angle. It just about works, or can work. RGR: Do you consider yourself anonymous? PP: Yes. I use anonymity in my work. I think it’s important that I’m only showing this self I’ve created so people can project themselves to it. If I show them another character or another person it’s going to confuse. RGR: It seems like there are two levels of anonymity that we are talking about. 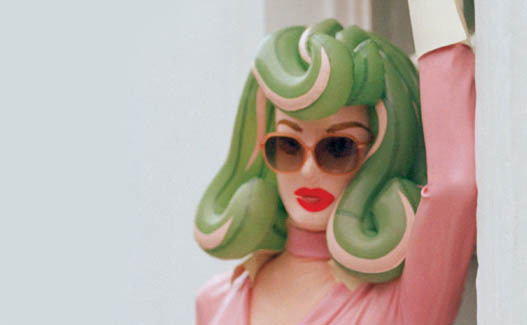 First, the anonymity of the artist, and second, the anonymity of Pandemonia as a mirror where anyone can see themselves. PP: When it comes to celebrities, they can’t be anonymous. They go down the street and people photograph them and know of them. I’m very much invisible. I can go anywhere and no one knows who I am. It’s wonderful. I’m free. I go to exhibitions, and shops, anywhere, and I’m completely invisible. RGR: Have you ever feared being caught? Do you talk about Pandemonia to other people while you are not her, or, have you been in that situation? RGR: Has it ever happened? I’m just very curious. PP: Yes, a few times. RGR: What is the process of building your costumes? PP: I start with drawings – pen and paper, basic stuff. I work with clay, then I make maquettes. I take photographs of them so that I know exactly what I want to make. Then I start making a pattern. Everything I do is 2D patterns of everything. Then I glue it all together and I press it. And you have Pandemonia. RGR: Latex is a very sexualized material. At the same time, the iconic tall, blond, slim, beautiful girl is also a very sexualized icon. Was this sexual connotation something that made you choose latex as the basis of your work? PP: Yes, very much so. There are a lot of things going on in here. Latex is like an allegory of pop culture. It’s shiny, inflatable, light and bouncy, very thin, it’s a bubble, it’s stretchy. It’s got a lot of things that go with pop culture. Wrap, shine, gloss. The sexuality in it is definitely important as well. Pandemonia, as I said, is like an über-person. It’s more than just a character, it’s very symbolic. The images I use are not archetypical images of beauty. Women used to sell everything. In advertising women are used to sell things because women are non-threatening, men like to look at them, women like to look at them. And I’m making this image that looks like pop culture. Sexuality is one of the main drives in us. I’m trying to get right into the psyche of our culture. I’m trying to get into the collective subconscious. I am kind of rearranging these symbols and repurposing them. I’m repurposing this celebrity archetype. Normally it would be used to sell products, but I’m kind of changing it. The sexuality has a sort of authenticity. It’s not my say, it actually affects people and it’s part of the mechanism of it. It’s like a marriage of these drives and looks and archetypes coming together. RGR: Latex is a material that encapsulates everything you have to say and makes your statement even stronger. PP: It’s really interesting. You know, I have been researching a bit and latex is made from liquid so it has no weave. Latex can stretch any way; it’s kind of nebulous. And it comes from the sap of trees, from amazonian trees – it’s the sap from mother nature. Sexuality is within our nature, within us. It’s something we can’t control. You might want to be something but the drive inside you is nature. You can temper it, but it’s beyond our control. I’m tapping into that. And I think these archetypes as well are very rooted in our psyche. RGR: It’s funny because probably, when someone sees you, nature is the last thing that comes to mind. But in reality everything is about our most instinctual self. Latex wraps it all together. PP: I could make all sorts of outlandish things; I could make really outrageous costumes if I wanted to. But I’m never going to appropriate culture. You’re never going to see a Pandemonia with ten heads or six arms. Pandemonia comes from our western culture and I’m talking about stuff that affects me and people around me in our world. RGR: What worries you these days? PP: Environment is an easy one to pick. I watched the news and I saw these guys sailing to the North Pole. Well, there’s supposed to be ice in there. It’s gone, it’s going. And they’re talking about putting shipping lanes in the North Pole. It’s gone, and that’s the environment. Whatever your politics – left wing, right wing, neoliberal, whatever – when the environment goes it will take us all out. So that’s the first thing that I guess should be changed. RGR: I’m sure you have received many offers from brands to associate your image with them in order to raise their value. What is something you would never do? PP: Land mines. I think I would get away with a lot of things. Cigarettes would be quite fun. It would be ironic and twisted. RGR: What do you wish to do? PP: Some beauty product, shampoo. PP: Yeah, and sun tan cream would be quite good. You know, when I did Camper I was very pleased about that. I’ve always wanted to do an advert. 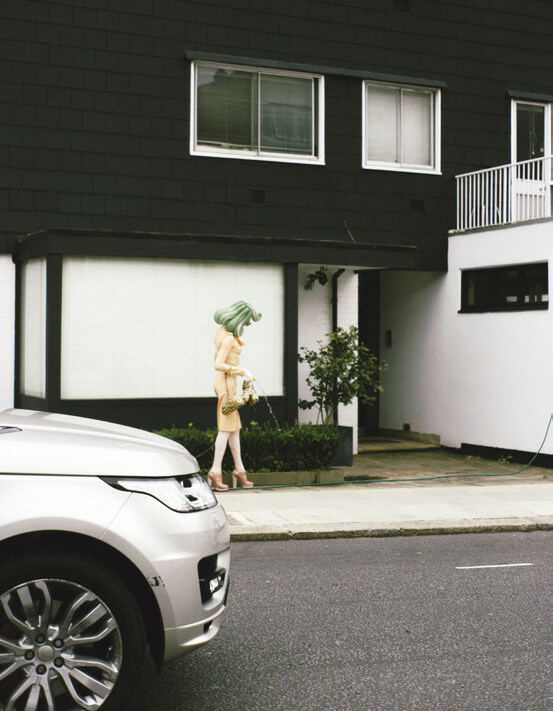 Pandemonia is an image that is supposed to work in real life, on paper, on the Internet. It’s cross-platform. I’m so inspired by advertising, so putting it in that environment would be a sort of pinnacle. So yes, I’d definitely do more adverts. RGR: So I guess being in a fashion magazine is also part of it. RGR: What’s the name of your dog again? PP: I have three dogs. Snowball, Snowbell, and Dotty. RGR: Do you see your dogs as a commodity? PP: Yes. I would like to do an ad with them as well, maybe for some dog food or dog toys. You know? Dogs really react to Pandemonia as well. RGR: To you or your dogs? PP: To me and my dogs. It affects them psychologically. They really react strongly. They always get very excited. RGR: And what about kids? PP: Kids get excited. Kids love it. But kids mirror their parents. I was coming out of this house a few months ago and this whole family with the kids and all were at the door entrance as I was leaving. The kids were all over me. Petting the dog, saying hello, messing around. They absolutely adore it. But when you get this kind of timid, scared people, the children will look at their parents and they will react the same way. RGR: Tell me about the choice of your name. PP: Pandemonia to me means chaos, creativity, freedom, freedom of thought, life. As an artist I created the year 0 and I brought this being into existence. It’s a way to disregard rules and find new possibilities. I can do things people can’t do. RGR: Do you feel privileged? PP: Yes, I do. Very privileged. RGR: Have you ever felt discriminated? PP: I have, actually. Yes. I sometimes find people… You know, people tend to take your face value. So people just assume that you are some kind of performer. They will deny the fact that I actually make my work. They won’t believe it, they’re like, “You can not have made this” which is ridiculous. And I wonder, how far does this discrimination go because this is just what I see. Are there waves of people behind them who assume wrong things as well? RGR: This is part of what you said before: you cannot control people’s reactions, or what they might think about it. PP: Yes. As Roland Barthes said, the death of the author. RGR: Masking ourselves is such a common and obvious thing these days. I assume it was also back then before you started Pandemonia, and this was one of the reasons to create it? PP: Sure. But there is something I would like to say. True anonymity is a luxury for the rich. We all build masks. We increasingly live in a more automatized life. The lifestyle we project is to show who we are, we are selling ourselves to people to show how successful we are. PP: Yes. And maybe it’s also for us as well. To remind us we have a great lifestyle. And I also think that maybe it would be easier if we all had different masks. Then maybe it would be easier to navigate in this dissolving boundary of public and private. If we all had like a variety of different names and masks. RGR: That could be pretty useful in the creative business. It feels like people in this business attach themselves too much to their job. The position matters more than the name. In other times and contexts there was or there is a big difference between your work persona and your role as a friend and your role as a parent, for example. In the circle of young creatives, it feels too blurry. PP: A few years ago it was an outrage to cross that boundary. Now it’s not, it’s accepted. Naive people will say “Just be yourself” and, I don’t know about you, but I have many selves. I don’t want to have to be accountable to different situations. I don’t want to be accountable to my work, or I don’t want to be accountable to my friends, I could do different things with them. RGR: I think it’s a matter of status again – a way for us to raise our own value. As you said the rich are anonymous, they don’t need to do this. PP: We are selling our life­styles. Our lives are being commodified all the time. You have to sell yourself to get a job, to get more work. You have to sell yourself to your friends. You have to show that you have enough likes on your Instagram and Twitter. And at the same time all this informa­tion you share online is being collected and sold on to ad­vertisers and media companies. Capitalism needs a new market. And it’s our private life this new market where it’s digging into. RGR: In a way this true ano­nymity of yours is admirable. You don’t need to be explaining yourself all the time. PP: It’s very tricky though. It’s very hard for me. Traditionally, the artist was in the outside of society look­ing in. I’m kind of a bit like that, I pass through socie­ty and I meet people and I do things. Then I return out. RGR: Can you imagine a society without masks? PP: I can’t, actually. I think they will always be there. Humans can’t never really get away of tribalism. We are part of a group, humans make sto­ries and myths, it’s a natu­ral thing that we do. It’s part of our psyche, encoded in us. Celebrity culture is like a shared story; we are never go­ing to get away from this. RGR: What would make Pandemonia stop existing? This entry was posted in Archive, Articles and tagged anthropology, Erving Goffman, Iris van Herpen, latex, mask, Masking, Metal, Metal mag, Nu pop, Pandemonia, Post Pop, Rocío Garrido Rus, Roland Barthes, Roy Lichtenstein, subconcious.